Learn how High Performance Liquid Chromatography works (HPLC principle) and how chromatographic column separates the compounds from a mixture. 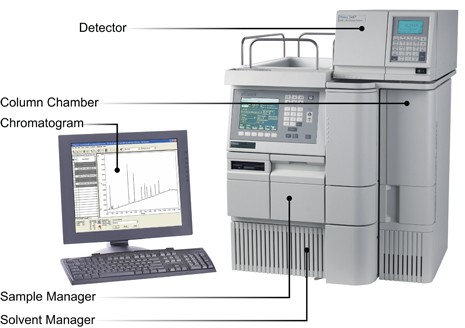 High-performance liquid chromatography is an effective type of column chromatography which is widely used in pharmaceuticals. It is very useful to determine the assay and related substances in drug substances. 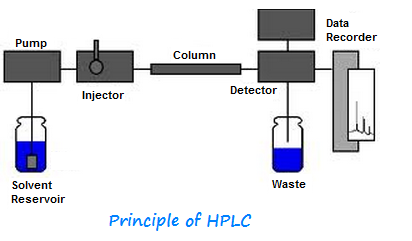 In general, HPLC is used to separate the components of a mixed drug substance. In HPLC chromatography, column plays a significant role in the separation of different compounds because it contains stationary phase. The stationary phase is a bad of polar or non-polar particles according to the type of column. Polar and non-polar columns are used according to the nature of the sample to be analyzed. Mechanical pumps are used to pump the mobile phase into the system and injector introduces the sample into the mobile phase which enters in the column at a constant flow rate. Mobile phase acts as a carrier in the whole process. When a mixture of compound enters in a column, it separates the compounds on the basis of their polarity. If stationary phase is non-polar then it attracts the non-polar compounds and a polar compound elutes first then a non-polar compound and if the stationary phase is polar then non-polar compound elutes first. Detectors are used to determine the separated compounds by ultraviolet absorption. The light absorption depends upon the concentration of the compound in the mobile phase. These response signals are recorded by the computer software in the form of peaks and purity of the compound is calculated by the peak area of different compounds. Computer system and software should be validated.